According to Hindu tradition, gotra is traced back to the seven Vedic sages, and in some castes, gotras were created by professions and not by birth. 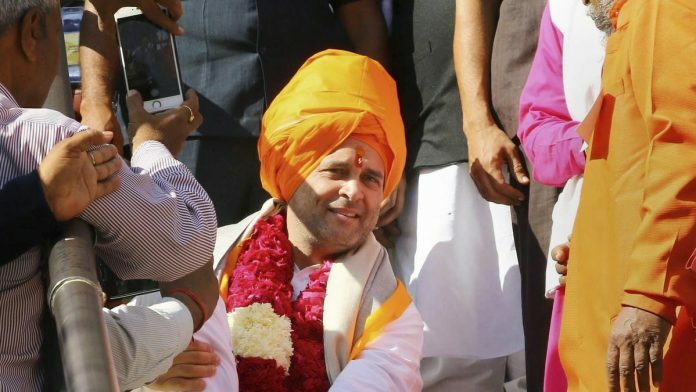 New Delhi: A temple priest in Pushkar, Rajasthan, who presided over the puja offered by Rahul Gandhi on 26 November, has claimed that the Congress president is a Kashmiri Pandit and belongs to the Dattatreya gotra (clan). This has once again led to a debate over his ancestry, as Rahul’s grandfather Feroze Gandhi was from the Parsi community. ThePrint asked priests and cultural scholars to explain how the Pushkar priest arrived at this conclusion. But there remains a bigger question: What exactly is gotra? As per the Hindu tradition, gotra is traced back to the seven Vedic sages collectively known as ‘Saptarishi’. While they are not mentioned in the Vedas, different antique sources like the Upanishads and Brahmanas name different rishis, including Agastya, Atri, Bharadwaj, Bhrigu, Gautam, Jamadagni, Kashyap, Vasishth, and Vishvamitra. The sages were said to be directly descended from Brahma, the creator of the universe, and hence their descendants were called ‘Brahmins’. Mahanand Jha, associate professor at the Shri Lal Bahadur Shastri Rashtriya Sanskrit Vidyapeetha, said later on, other caste groups like Kshatriyas, Vaishyas and Shudras also adopted the gotras. In some castes, the gotras were created by professions and not by birth. For example, blacksmiths belong to the Sanaga gotra, while goldsmiths are from Suparnasa gotra. Gotra lineage can be traced back in two ways — putra parampara where it is passed on from father to son, or shishya parampara where the student takes on the gotra of his guru. “If someone is orphaned or does not have contact with his father, he can use the gotra of his teacher, as he is equivalent to the father,” said Sharma. In some villages in Kerala, though, gotra is adopted from the mother’s side. Patriarchy has ensured that an unmarried girl belongs to her father’s gotra, but adopts the husband’s gotra after marriage. Hindu tradition forbids marriages within the same gotra, as they are supposed to be descendants of the same parent (Saptarishi) and are thought of as siblings or cousins. However, Sharma said there exists the shaka system, which allows a bride and groom of the same gotra to marry if they reside in two different regions of the country. Jha said apart from spiritual reasons, there was also a scientific reason behind this. “Scientifically, if you marry within the same gotra, there is a high possibility that the blood group is the same, which can lead to medical complications. On the spiritual level, you will be marrying your cousins,” he claimed. Sharma and Jha agree that the ignorance of modern-day Hindus about their gotras is causing a lot of trouble, and will have a negative impact on future generations. While Sharma said performing religious ceremonies, even cremation, had become difficult because people didn’t know their gotra, Jha claimed this ignorance was a major factor behind the rising number of divorces in the country.